^ Simms, William Q. Two Lights on the Hill. Lighthouse Digest, Inc.
^ Description of the Geology of York County Peninsula. Pennsylvania State University Libraries. ^ Kelton, Dwight H. Indian Names of Places Near the Great Lakes. Detroit, Michigan: Detroit Free Press Printing Company. 1888年. ^ Halsey, Francis Whiting. The Old New York Frontier. New York: Charles Scribner's Sons. 1901年. ^ Sec.13. The Doctorine and Covenents of the Church of Jesus Christ of Latter-Day Saints. Intellectual Reserve, Inc. 2006年. ^ Sec.27. The Doctorine and Covenents of the Church of Jesus Christ of Latter-Day Saints. Intellectual Reserve, Inc. 2006年. ^ Storey, Henry Wilson. History of Cambria County, Pennsylvania. New York: The Lewis Publishing Company. 1907年. 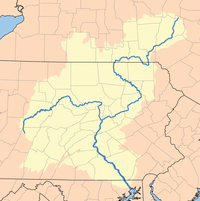 ^ Susquehanna River Named America's Most Endangered River for 2005. Annapolis, Maryland: Chesapeake Bay Foundation. 2005年4月13日.